I have the world’s most beautiful mittens, even with a mismatched thumb. holy moly.. those mittens are gorgeous!!! I have to tell you that I’m a tremendous fan, and I’m so glad to have discovered your blog and flickr site. I’ve been knitting for about five years and just recently have been inspired to take my knitting to the next level. I’m enrolled in an aran workshop to learn the art of cabling, bobbling etc so that I can knit the sweaters that my English family knit so well. After finding “Hello Yarn” I’m now inspired to also learn stranded colour work knitting. I just received my book on Selbu knitting and I’m over the moon about your mom’s mittens! I would buy the kit in a heartbeat! Anyway, thanks for sharing all of your wonderful projects, its been a true inspiration for me! Wow, I really had no idea about the issue with cashmere. Thanks for posting that link. Also, thanks for involving your conscience in your business. I’ll look forward to those kits! The mittens are absolutely wonderful! I love the mitts. So amazing! I can’t wait for the kit. *doh* It’s the same article. Oh my goodness, they’re so gorgeous! I have been admiring the little glimpses of these you’ve shown on Flickr for awhile now. I’m so excited to hear you’ll be selling them as a kit…I look forward to being able to knit these! And thank you for posting about the problems with cashmere. I try to avoid it, too. I’m perfectly happy with good old alpaca. Those mittens are so great! I will definitely have to get your kit when they are ready! I adore them! put me down for a kit please!! Gorgeous work, as always! Thank you for sharing! Fantastic! Looking forward to the kits. Beautiful! I’m sure your mom will wear them with pride! Amazing mittens! I will happily buy a kit or two. Thanks for the link to the cashmere article. How tragic. These are so much fun! I look forward to seeing the kits, and I’m sure they’ll sell ridiculously fast. (I blame you for single-handedly driving up the popularity — and price — of Magnificent Mittens, by the way). Two words for the lining: bunny blend. beautiful! the colors and the scrolls (I’m totally with you on that one – never too many!) I’ll happily volunteer to test knit if you are looking for people – I need to branch out from socks!! What beautiful mittens! I’m looking forward to the kit — could you maybe do a merino lining? Alpaca can be itchy even though it’s soft! Oh how I love these! So beautiful, wonderful colors. Thanks also for the link, I too had no idea about the cashmere issue. So gorgeous! Your Mum is very lucky indeed. Those mittens are fabulous and I will need a kit when they come out. I saw the mittens first over at Ravelry on the stranded group and will be trying my hand at mittens very soon, although something easier. unspeakably perfect, even with the mismatched thumb. your knitting truly awes me. Oh those are loverly and please let me know as soon as kits are avaliable! I do believe that those mitts will be involved in poping my stranded mitt cherry! And I agree one can never have too many spirals! Three of my tattoos are celtic/pictish inspired spirals. They are just beautiful – the flow of color – the scrolls – everything! I want a kit!!! Must have mittens! Love the colours. It looks like you might run out of kits though ;-) Will you be selling just the pattern too? Gorgeous gorgeous gorgeous! I should thank you, I gave tins of hot chocolate mix heavily influenced by your recipe (three flavors, Mexican, vanilla and peppermint), the double dose of chocolate makes all the difference. It was a hit! I love these so much! Every time a photo of these popped up on Flickr I got so excited. I am glad to hear you are putting together a kit for these, awesome! Positively stunning, gorgeous, fabulous … all the superlatives! The colour combo is amazing and I especially loved the limey green lining (my current fave colour!). I’d definitely be interested in a kit! Simply Stunning! What AWESOME colors! That is such a lovely gift. I love the oatmeal color as the base of the mitten. Scrumptious!!! The colors, the pattern it’s all perfect. As if that weren’t enough, I’m sure that cashmere lining is heavenly! They’re beautiful! I’m loving brightly colored yarn paired with white. Also, I am really wanting to try out lined mittens. Maybe this will be the winter. If you do make kits, do you think you’d offer any without mohair/alpaca, or if not that, just the pattern without the kit? Your mom sure is lucky! I’m so excited you’ll be offering these as a kit. Drop me a line if you need some more test knitters. These are so stunning! What a wonderful combination of texture and color. A great ending to an amazingly creative year – hooray! Oh my! I hunger for those lovely mittens, and will gladly buy a kit. More importantly though, thanks for the cashmere education. I had no idea, try as I might to make informed shopping decisions. WOW…absolutely stunning. I’d love to have a kit. I’ll be watching to see when they become available. Thank you for sharing. Delurking to exclaim over your lovely mittens. Your mother is lucky woman. Who’s thirsty and cold? I am! I took inspiration from your hot chocolate/marshmallows/cookies idea for Christmas. I added some coasters that I made from scraps, like the ones over at kelp! knits. Inexpensive and delicious – but I gave all mine away! Shoulda kept some for myself – it snowed today, and hot tea simply doesn’t have the same comforting richness :). i am drooling over these. i love your mittens. all of them have something cute and romantic about them and reminds me of a song by nick cave about girls who lost their mittens under fifteen feet of pure with snow (may that never happen). there is also something orla kiely about them. love the prints of this irish designer (who does a bit of knitwear as well). you are a real unventer. I hereby award you the Mitten Ambassador Award for your undying promotion and increased visibility of the knitting through beautiful Mitten design! And dude, count me in a customer for those! Of course she liked them! They’re beautiful. Wow! Those are so pretty! Nice work! What gorgeous mittens! Count me in for a kit as well. I love the colors of these mittens and hope you offer the kit in the same colors. I adapted your “We Call them Pirates” hat pattern for a headband for my daughter’s boyfriend for Christmas and he loved it. your patterns are great. Thanks for so many wonderful freebies, and I will be more than happy to purchase the mitten kit when you’re ready to offer it. thump. That was my jaw hitting the floor. These are beautiful! I love them! I picked up the Knitters book of yarn the other day and I totally want to make all of your mittens! even this one! I know this one isn’t in the book. But WOW !! I want to buy the kit! sign me up! What awesome mittens! I love everything about them. Your mom is so lucky! Beautiful mittens! I live in California where any kind of mitten is rarely needed, but a lined pair is NEVER needed. I’ve only knitted a couple of pairs of mittens–would I have to change the pattern a lot to get them to fit properly without a lining? Thank you. Fab Mitts and thanks for the article link. I just dyed my first and last cashmere. Great education. Can’t wait to buy that kit!! ps. Here in MN we’ve so much snow. Definitely cold and workin up a thirst! Love the mittens…and a kit would be great! OMG they’re gorgeous! Can’t wait for the kits! I would love to by the kit, an I woud love it anny more if the yarn is Eco-yarn. Those are so pretty – I love them! And I bet they are divinely soft to wear. Your mom is very lucky! waiting with bated breath for the kits! Adrian, you are my Czarina of Mittens. I love them all, and *these* are just luscious. They look fabulous. Looking forward to the kits going on sale! When you create the kit, count me in! Indeed there are never enough spirals. Adrian those mittens are just lovely, I will certainly want a kit. I also have all 3 seasons of Deadwood, how disappointing they did not continue on to the 4th. Beautiful!!!! And kits? Even better! Absolutely Brilliant!!!! Happy New Year, Dahlink! Oh my goodness, I adore those mittens! I can’t wait to get the kit and knit these for myself! Moms mittens are so beautiful. If any of my girls gave them to me as a gift I’d be totally blown away. I’m sure your mom loved them. Happy New Year Adrian and thanks for all the great yarn and knitting inspiration. So amazing. I may be lining up for one of those kits. And thanks for the article link, it is so easy to use/buy things that we don’t know the story behind. I’ve been reading your posts and shop for a while, too, like Gwendolen and others. Count me in for another vote for kits of your beautiful work! yes! yes! yes! All your work is fabulous…I went a little crazy with your Pirate patterns. It’s incredible that you are so generous to share your patterns and allows us (out there in web-land) know a bit about your giving, talented, hard-working personality. heh – “hung dei” indeed, although another quote from Deadwood bounced into my head which would certainly be censored…thing Calamity Jane. I just stumbled upon your mittens on Ravelry and am in awe of how fabulous they are. I can’t wait for the kit! GORGEOUS mittens! I constantly marvel at how many beautiful, creative things you knit! Stunning! I’m anxiously awaiting the kit! Thanks for shipping the “Espresso” roving so quickly! Got it a few days ago, and it’s sitting where I can walk past it several times a day and drool! All that toasty brown goodness – can’t wait to spin it up! Thanks again! Sign me up for a kit of those. They are gorgeous! Love all your photos and comments about your projects. Very inspiring! Selling the mittens as a kit is a great idea. Lovely mittens! So glad you’ve decided to sell them in kits. Oh my goodness! Those mittens are just gorgeous!!! Simply scrumptious! oh geez…a kit??? when??? yes, please!!! 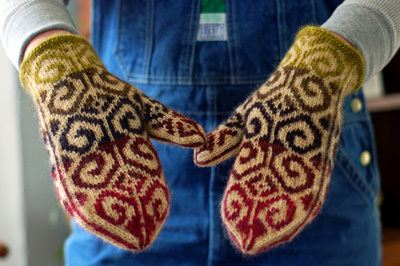 I love these mitten & am REALLY interested in a kit. Please keep me(us) posted! My niece loves these mittens. Let me know when you have the kit available. They are lovely! OMG. I SO LOVE those!!! !